The following are a set of methods intended for regression in which the target value is expected to be a linear combination of the input variables. In mathematical notion, if is the predicted value. Across the module, we designate the vector as coef_ and as intercept_. 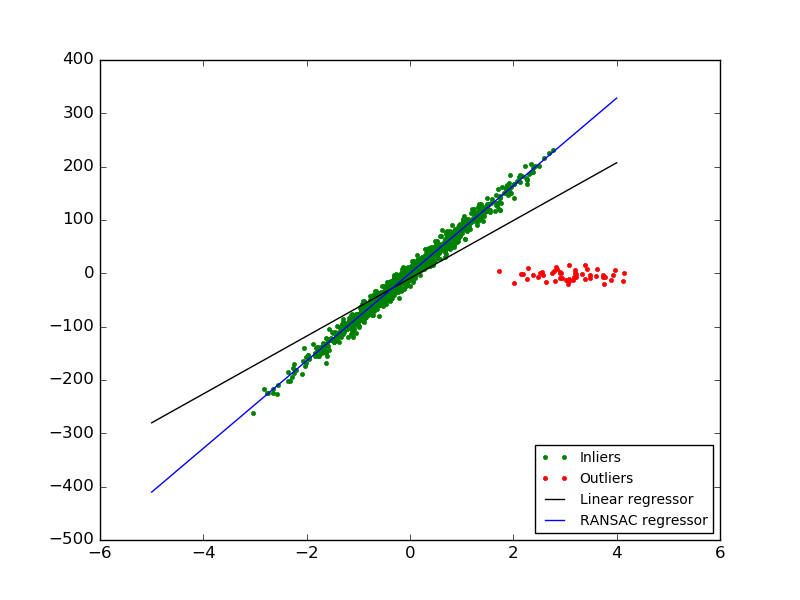 To perform classification with generalized linear models, see Logistic regression. However, coefficient estimates for Ordinary Least Squares rely on the independence of the model terms. When terms are correlated and the columns of the design matrix have an approximate linear dependence, the design matrix becomes close to singular and as a result, the least-squares estimate becomes highly sensitive to random errors in the observed response, producing a large variance. This situation of multicollinearity can arise, for example, when data are collected without an experimental design. This method computes the least squares solution using a singular value decomposition of X. If X is a matrix of size (n, p) this method has a cost of , assuming that . Here, is a complexity parameter that controls the amount of shrinkage: the larger the value of , the greater the amount of shrinkage and thus the coefficients become more robust to collinearity. This method has the same order of complexity than an Ordinary Least Squares. The Lasso is a linear model that estimates sparse coefficients. It is useful in some contexts due to its tendency to prefer solutions with fewer parameter values, effectively reducing the number of variables upon which the given solution is dependent. For this reason, the Lasso and its variants are fundamental to the field of compressed sensing. Under certain conditions, it can recover the exact set of non-zero weights (see Compressive sensing: tomography reconstruction with L1 prior (Lasso)). The lasso estimate thus solves the minimization of the least-squares penalty with added, where is a constant and is the -norm of the parameter vector. 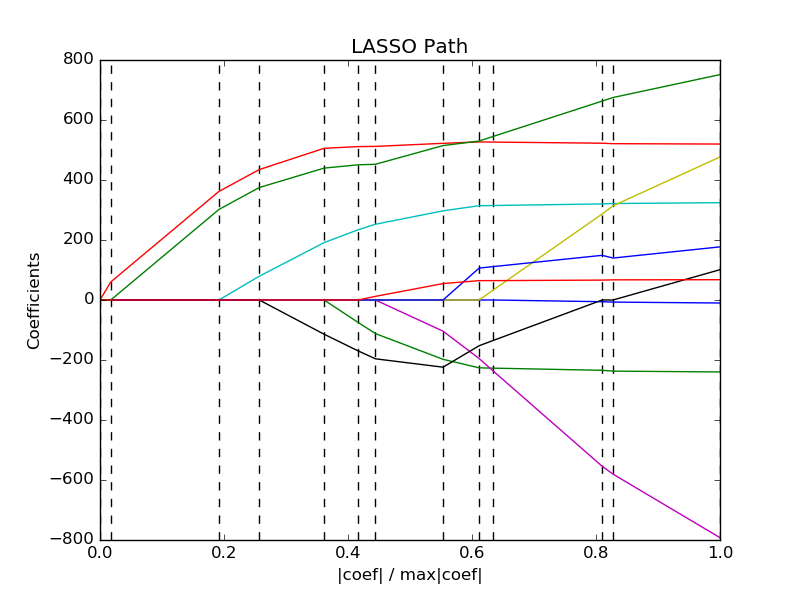 Also useful for lower-level tasks is the function lasso_path that computes the coefficients along the full path of possible values. As the Lasso regression yields sparse models, it can thus be used to perform feature selection, as detailed in L1-based feature selection. For feature selection or sparse recovery, it may be interesting to use Randomized sparse models. The alpha parameter controls the degree of sparsity of the coefficients estimated. 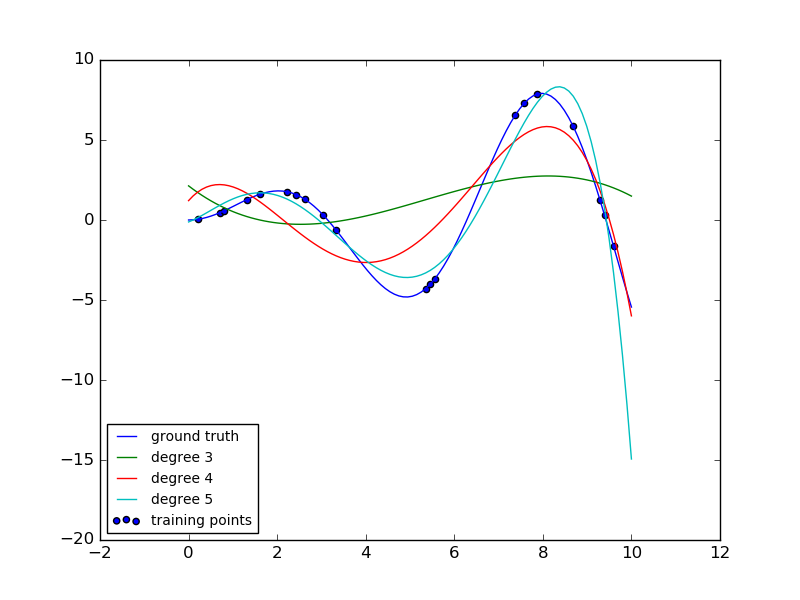 scikit-learn exposes objects that set the Lasso alpha parameter by cross-validation: LassoCV and LassoLarsCV. LassoLarsCV is based on the Least Angle Regression algorithm explained below. For high-dimensional datasets with many collinear regressors, LassoCV is most often preferable. However, LassoLarsCV has the advantage of exploring more relevant values of alpha parameter, and if the number of samples is very small compared to the number of observations, it is often faster than LassoCV. 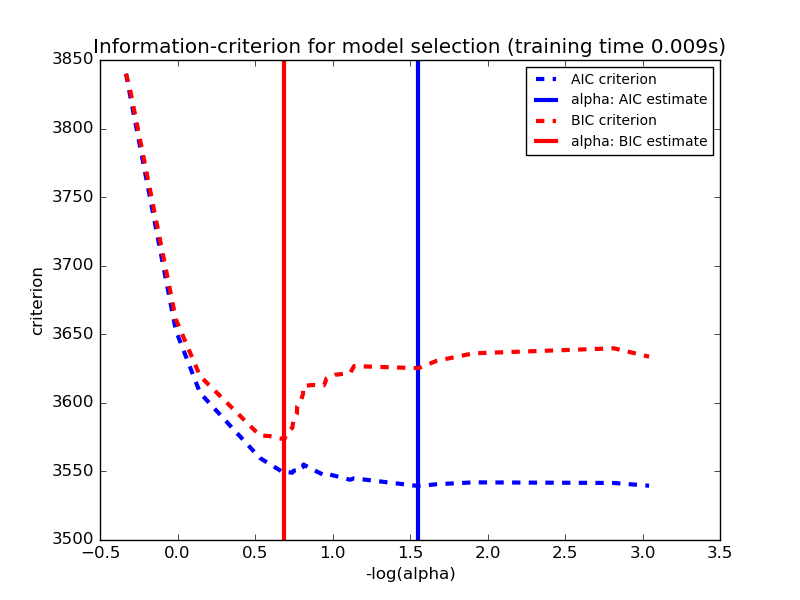 Alternatively, the estimator LassoLarsIC proposes to use the Akaike information criterion (AIC) and the Bayes Information criterion (BIC). 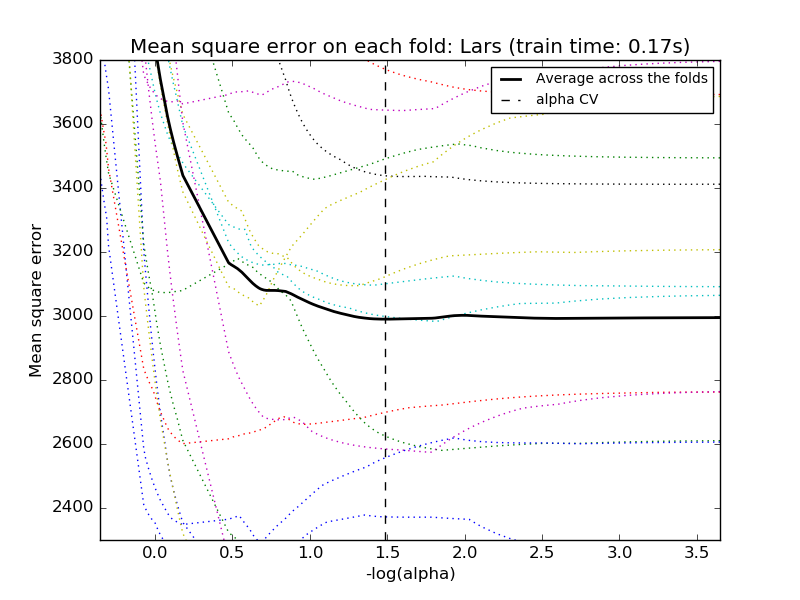 It is a computationally cheaper alternative to find the optimal value of alpha as the regularization path is computed only once instead of k+1 times when using k-fold cross-validation. However, such criteria needs a proper estimation of the degrees of freedom of the solution, are derived for large samples (asymptotic results) and assume the model is correct, i.e. that the data are actually generated by this model. They also tend to break when the problem is badly conditioned (more features than samples). ElasticNet is a linear regression model trained with L1 and L2 prior as regularizer. This combination allows for learning a sparse model where few of the weights are non-zero like Lasso, while still maintaining the regularization properties of Ridge. We control the convex combination of L1 and L2 using the l1_ratio parameter. Elastic-net is useful when there are multiple features which are correlated with one another. 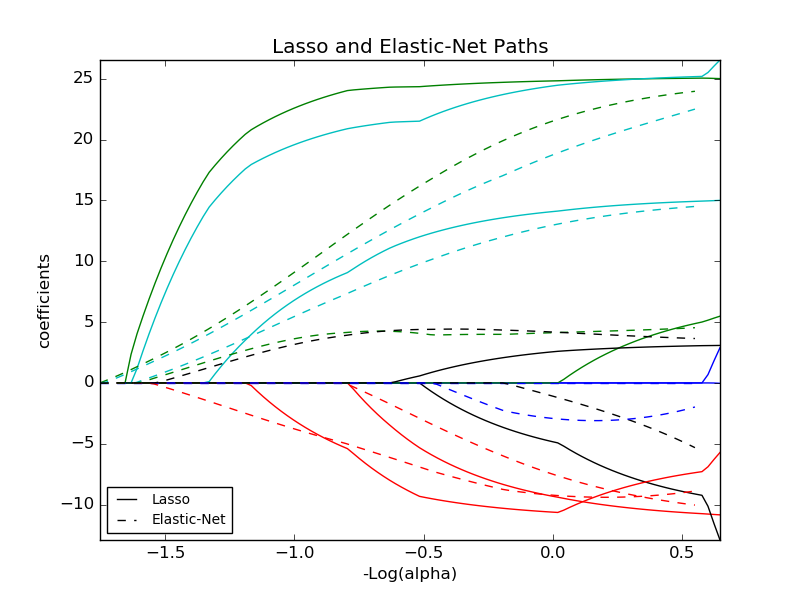 Lasso is likely to pick one of these at random, while elastic-net is likely to pick both. A practical advantage of trading-off between Lasso and Ridge is it allows Elastic-Net to inherit some of Ridge’s stability under rotation. The class ElasticNetCV can be used to set the parameters alpha ( ) and l1_ratio ( ) by cross-validation. The MultiTaskLasso is a linear model that estimates sparse coefficients for multiple regression problems jointly: y is a 2D array, of shape (n_samples, n_tasks). The constraint is that the selected features are the same for all the regression problems, also called tasks. The following figure compares the location of the non-zeros in W obtained with a simple Lasso or a MultiTaskLasso. 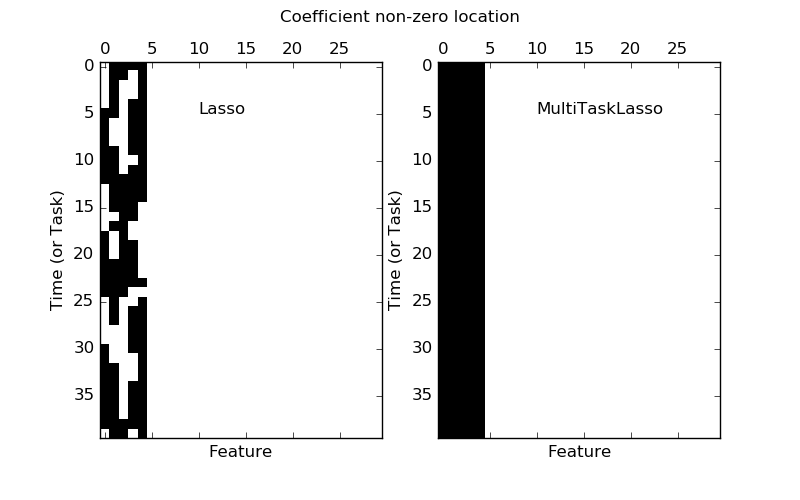 The Lasso estimates yields scattered non-zeros while the non-zeros of the MultiTaskLasso are full columns. 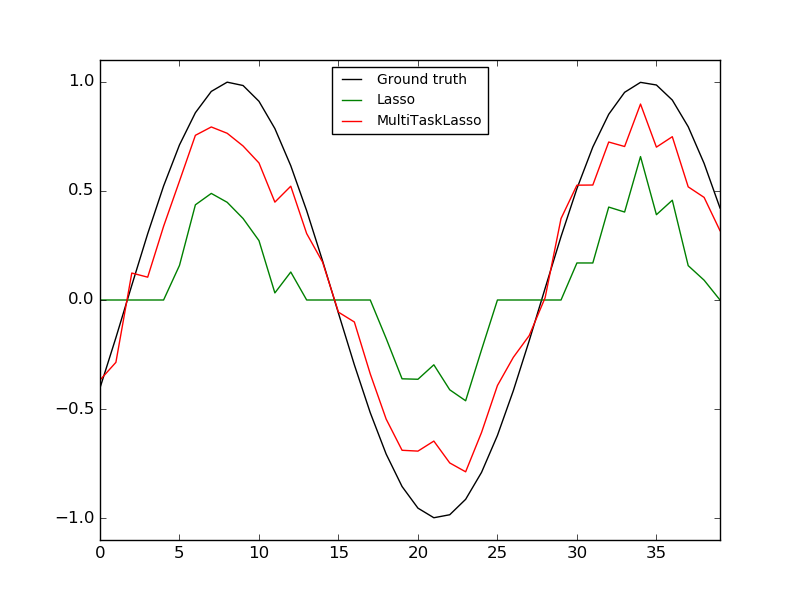 The implementation in the class MultiTaskLasso uses coordinate descent as the algorithm to fit the coefficients. Least-angle regression (LARS) is a regression algorithm for high-dimensional data, developed by Bradley Efron, Trevor Hastie, Iain Johnstone and Robert Tibshirani. It is computationally just as fast as forward selection and has the same order of complexity as an ordinary least squares. It produces a full piecewise linear solution path, which is useful in cross-validation or similar attempts to tune the model. If two variables are almost equally correlated with the response, then their coefficients should increase at approximately the same rate. The algorithm thus behaves as intuition would expect, and also is more stable. Because LARS is based upon an iterative refitting of the residuals, it would appear to be especially sensitive to the effects of noise. This problem is discussed in detail by Weisberg in the discussion section of the Efron et al. (2004) Annals of Statistics article. The LARS model can be used using estimator Lars, or its low-level implementation lars_path. LassoLars is a lasso model implemented using the LARS algorithm, and unlike the implementation based on coordinate_descent, this yields the exact solution, which is piecewise linear as a function of the norm of its coefficients. The algorithm is similar to forward stepwise regression, but instead of including variables at each step, the estimated parameters are increased in a direction equiangular to each one’s correlations with the residual. Instead of giving a vector result, the LARS solution consists of a curve denoting the solution for each value of the L1 norm of the parameter vector. The full coefficients path is stored in the array coef_path_, which has size (n_features, max_features+1). The first column is always zero. OrthogonalMatchingPursuit and orthogonal_mp implements the OMP algorithm for approximating the fit of a linear model with constraints imposed on the number of non-zero coefficients (ie. the L 0 pseudo-norm). OMP is based on a greedy algorithm that includes at each step the atom most highly correlated with the current residual. It is similar to the simpler matching pursuit (MP) method, but better in that at each iteration, the residual is recomputed using an orthogonal projection on the space of the previously chosen dictionary elements. 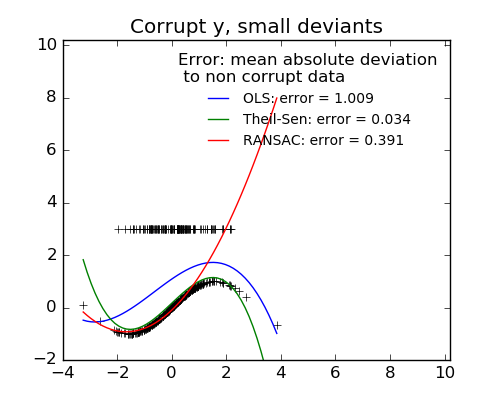 Bayesian regression techniques can be used to include regularization parameters in the estimation procedure: the regularization parameter is not set in a hard sense but tuned to the data at hand. This can be done by introducing uninformative priors over the hyper parameters of the model. The regularization used in Ridge Regression is equivalent to finding a maximum a-postiori solution under a Gaussian prior over the parameters with precision . Instead of setting lambda manually, it is possible to treat it as a random variable to be estimated from the data. Alpha is again treated as a random variable that is to be estimated from the data. It adapts to the data at hand. It can be used to include regularization parameters in the estimation procedure. Inference of the model can be time consuming. The priors over and are chosen to be gamma distributions, the conjugate prior for the precision of the Gaussian. The resulting model is called Bayesian Ridge Regression, and is similar to the classical Ridge. 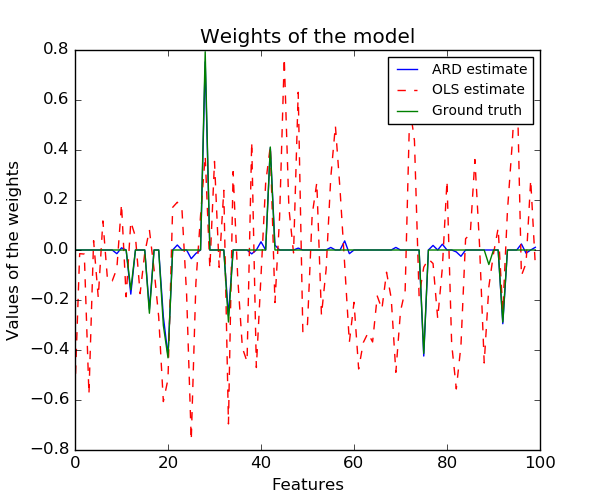 The parameters , and are estimated jointly during the fit of the model. The remaining hyperparameters are the parameters of the gamma priors over and . These are usually chosen to be non-informative. The parameters are estimated by maximizing the marginal log likelihood. 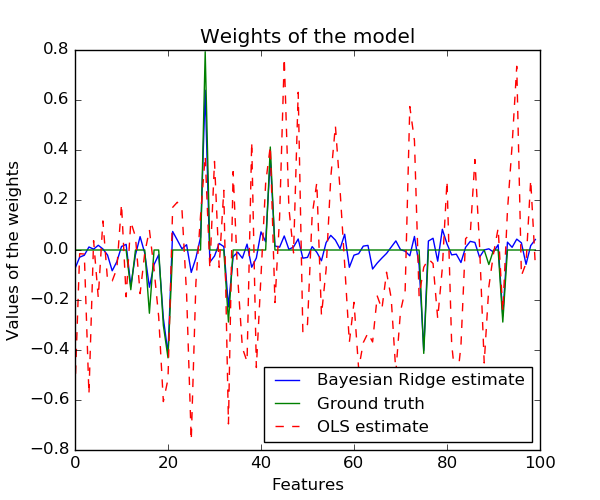 Due to the Bayesian framework, the weights found are slightly different to the ones found by Ordinary Least Squares. However, Bayesian Ridge Regression is more robust to ill-posed problem. 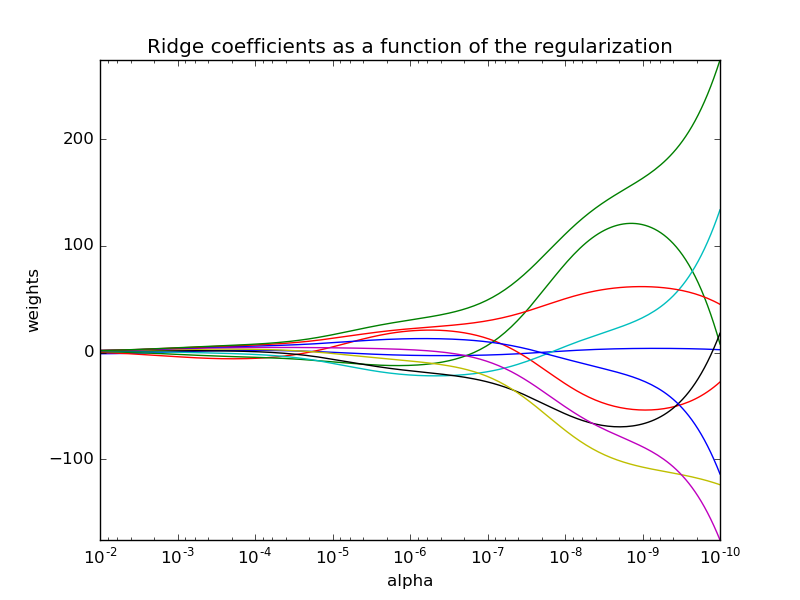 ARDRegression is very similar to Bayesian Ridge Regression, but can lead to sparser weights  . ARDRegression poses a different prior over , by dropping the assumption of the Gaussian being spherical. Instead, the distribution over is assumed to be an axis-parallel, elliptical Gaussian distribution. In contrast to Bayesian Ridge Regression, each coordinate of has its own standard deviation . The prior over all is chosen to be the same gamma distribution given by hyperparameters and . 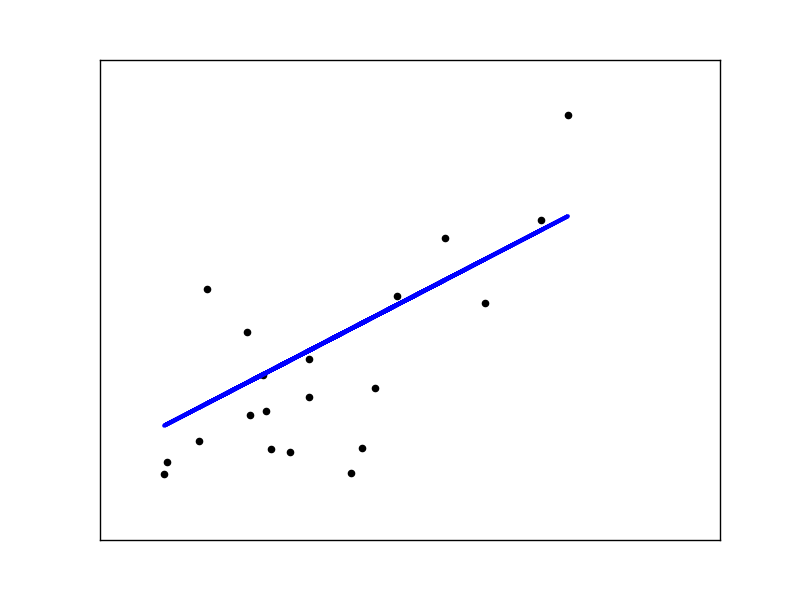 The implementation of logistic regression in scikit-learn can be accessed from class LogisticRegression. This implementation can fit a multiclass (one-vs-rest) logistic regression with optional L2 or L1 regularization. The solvers implemented in the class LogisticRegression are “liblinear” (which is a wrapper around the C++ library, LIBLINEAR), “newton-cg”, “lbfgs” and “sag”. The “lbfgs” and “newton-cg” solvers only support L2 penalization and are found to converge faster for some high dimensional data. L1 penalization yields sparse predicting weights. The solver “liblinear” uses a coordinate descent (CD) algorithm based on Liblinear. For L1 penalization sklearn.svm.l1_min_c allows to calculate the lower bound for C in order to get a non “null” (all feature weights to zero) model. This relies on the excellent LIBLINEAR library, which is shipped with scikit-learn. However, the CD algorithm implemented in liblinear cannot learn a true multinomial (multiclass) model; instead, the optimization problem is decomposed in a “one-vs-rest” fashion so separate binary classifiers are trained for all classes. This happens under the hood, so LogisticRegression instances using this solver behave as multiclass classifiers. Setting multi_class to “multinomial” with the “lbfgs” or “newton-cg” solver in LogisticRegression learns a true multinomial logistic regression model, which means that its probability estimates should be better calibrated than the default “one-vs-rest” setting. “lbfgs”, “newton-cg” and “sag” solvers cannot optimize L1-penalized models, though, so the “multinomial” setting does not learn sparse models. The solver “sag” uses a Stochastic Average Gradient descent . It does not handle “multinomial” case, and is limited to L2-penalized models, yet it is often faster than other solvers for large datasets, when both the number of samples and the number of features are large. For large dataset, you may also consider using SGDClassifier with ‘log’ loss. A logistic regression with L1 penalty yields sparse models, and can thus be used to perform feature selection, as detailed in L1-based feature selection. 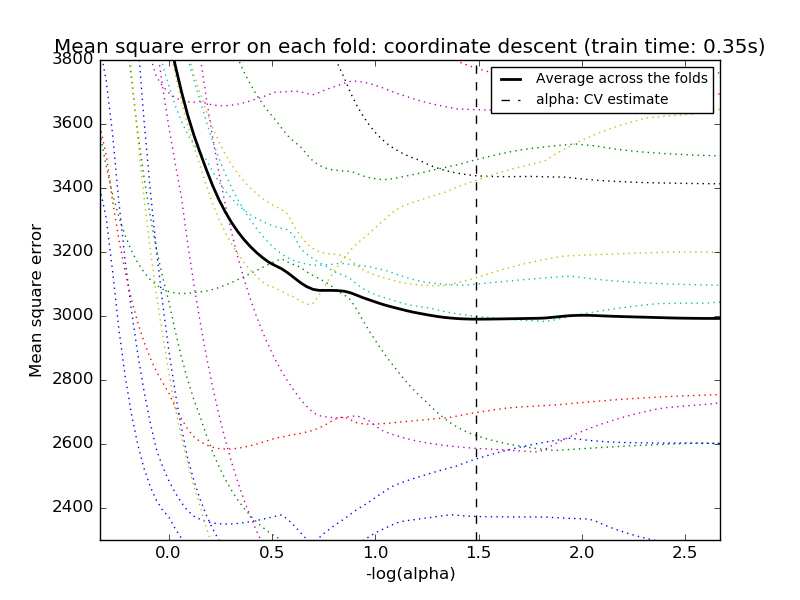 LogisticRegressionCV implements Logistic Regression with builtin cross-validation to find out the optimal C parameter. “newton-cg”, “sag” and “lbfgs” solvers are found to be faster for high-dimensional dense data, due to warm-starting. For the multiclass case, if multi_class option is set to “ovr”, an optimal C is obtained for each class and if the multi_class option is set to “multinomial”, an optimal C is obtained that minimizes the cross-entropy loss. Stochastic gradient descent is a simple yet very efficient approach to fit linear models. It is particularly useful when the number of samples (and the number of features) is very large. The partial_fit method allows only/out-of-core learning. The classes SGDClassifier and SGDRegressor provide functionality to fit linear models for classification and regression using different (convex) loss functions and different penalties. E.g., with loss="log", SGDClassifier fits a logistic regression model, while with loss="hinge" it fits a linear support vector machine (SVM). The last characteristic implies that the Perceptron is slightly faster to train than SGD with the hinge loss and that the resulting models are sparser. The passive-aggressive algorithms are a family of algorithms for large-scale learning. They are similar to the Perceptron in that they do not require a learning rate. However, contrary to the Perceptron, they include a regularization parameter C.
For classification, PassiveAggressiveClassifier can be used with loss='hinge' (PA-I) or loss='squared_hinge' (PA-II). For regression, PassiveAggressiveRegressor can be used with loss='epsilon_insensitive' (PA-I) or loss='squared_epsilon_insensitive' (PA-II). 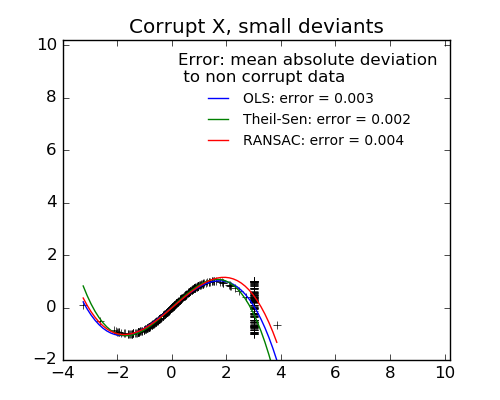 Robust regression is interested in fitting a regression model in the presence of corrupt data: either outliers, or error in the model. An important notion of robust fitting is that of breakdown point: the fraction of data that can be outlying for the fit to start missing the inlying data. Note that in general, robust fitting in high-dimensional setting (large n_features ) is very hard. The robust models here will probably not work in these settings. RANSAC (RANdom SAmple Consensus) fits a model from random subsets of inliers from the complete data set. 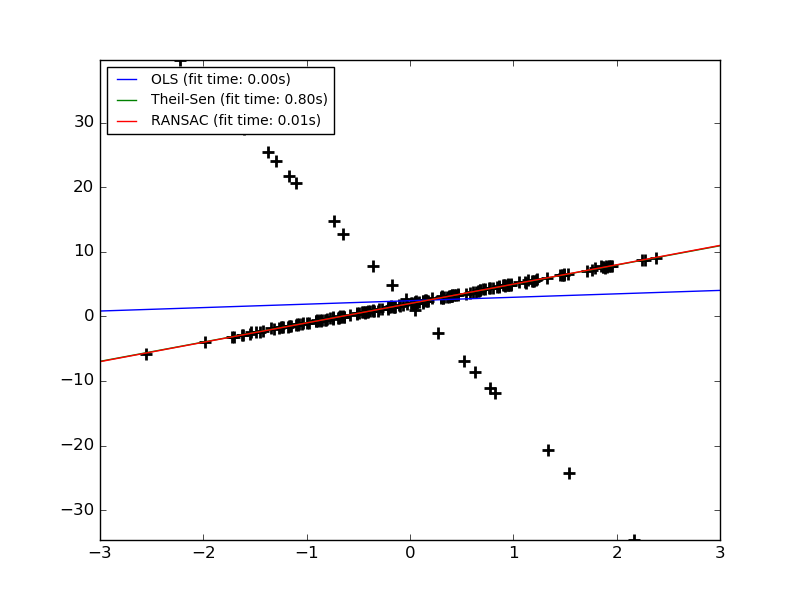 RANSAC is a non-deterministic algorithm producing only a reasonable result with a certain probability, which is dependent on the number of iterations (see max_trials parameter). It is typically used for linear and non-linear regression problems and is especially popular in the fields of photogrammetric computer vision. The algorithm splits the complete input sample data into a set of inliers, which may be subject to noise, and outliers, which are e.g. caused by erroneous measurements or invalid hypotheses about the data. The resulting model is then estimated only from the determined inliers. The features of X have been transformed from to , and can now be used within any linear model. The linear model trained on polynomial features is able to exactly recover the input polynomial coefficients.